On August 8, 2018, Pacific Power Blue Sky Habitat customers, together with The Freshwater Trust (TFT), announced an award of $145,000 to help fund five river restoration projects throughout the state of Oregon. The Freshwater Trust is a nonprofit freshwater conservation and restoration organization with a mission to preserve and restore freshwater ecosystems. The 501(c)(3) organization has offices in Oregon, Idaho and California. Pacific Power, which serves communities throughout Oregon, helps customers improve the natural environment via its Blue Sky renewable energy program. This includes the Blue Sky Habitat option, which allows residential and small business customers in Oregon to support renewable energy equal to their monthly electricity use, and make a donation to restore and preserve habitat for Oregon native fish – all through their electric bill each month. The monthly donations from Pacific Power customers are pooled, then passed to TFT, which administers the grants. “Thanks to the generosity of Pacific Power customers throughout the state, we’re able to support worthy projects that benefit Chinook, coho, lamprey, steelhead and more,” said Jeff Fisher, habitat monitoring coordinator with TFT. The funding for 2018 will support the North Coast Watershed Association, Rogue River Watershed Council, Lomakatsi Restoration Project, and TFT, which are working on restoration projects in the Rogue, Sandy and John Day basins. TFT received funds to install seven new large wood structures on Little Butte Creek, a tributary of the Rogue, and to continue its long-standing work of restoring side channels and wetlands in the Sandy. In partnership with TFT, Blue Sky Habitat projects have helped aid the restoration of approximately 157 river miles in 13 counties that Pacific Power services in Oregon. These river miles now have the benefit of clear fish passage, native plantings along the river’s edge, and structures that create habitat and activate breeding grounds for fish and other aquatic organisms. In addition to benefiting river ecology, these Blue Sky projects have also involved the local community through volunteerism and youth education. Pacific Power first partnered with TFT in 2011. The Blue Sky Habitat option has existed for 16 years and currently boasts more than 5,500 participants. 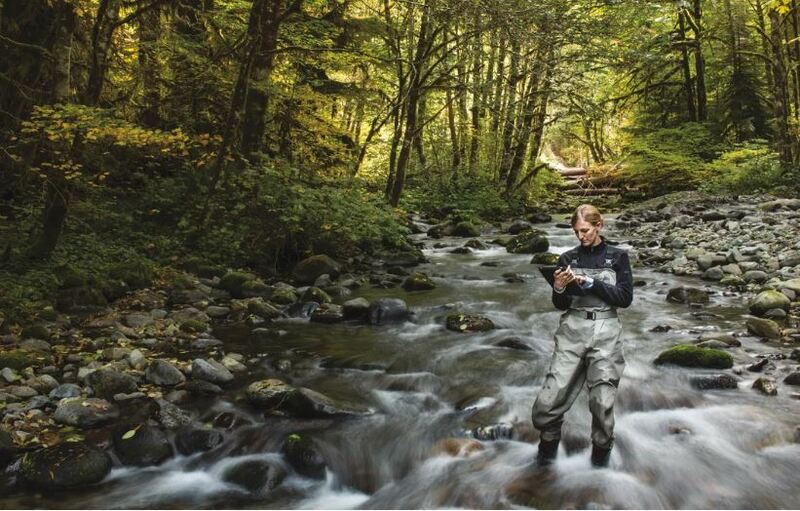 Since 2002, Pacific Power’s Blue Sky Habitat renewable energy option has provided residential and small business customers with a way to purchase and support renewable energy while also helping to restore and preserve habitats for native fish in Oregon. As with other Blue Sky options, customers who participate in Blue Sky Habitat are reducing dependence on fossil fuels, encouraging more renewable energy generation and tying 100 percent of their usage to renewable energy resources. Photo courtesy of The Freshwater Trust. See The Freshwater Trust website. See Pacific Power’s Blue Sky Habitat website.